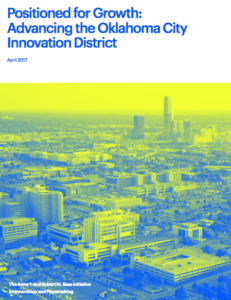 Today, a new report outlining a growth strategy for Oklahoma City’s emerging innovation district, an area encompassing the Oklahoma Health Center and Automobile Alley, was released by the Anne T. and Robert M. Bass Initiative on Innovation and Placemaking—a joint initiative with the Brookings Institution and Project for Public Spaces. The culmination of an 18-month study, the report assesses the Oklahoma City metro region economy and offers recommendations on industry innovation, placemaking, and inclusive growth practices to strengthen the innovation district and the broader region. For Oklahoma City’s innovation district to succeed, the region’s public and private leaders must better capitalize on the area’s dominant industries and invest in high-quality places where research institutions, firms, and talent concentrate and connect. Furthermore, they should explore how regionally-competitive industries, such as healthcare and energy, can converge to form new businesses and fields. City leaders should also improve the region’s ability to attract a talented workforce and to provide training and employment opportunities for area residents who are not currently connected to the innovation economy. To operationalize these priorities, district leaders should establish a new type of innovation district governance entity that gives voice to the district’s narrative, defines its vision, and helps it act as a unified place. With detailed analyses of the Oklahoma City region’s challenges and opportunities, and assessments of best practices in other cities and innovation districts, this important report offers a clear strategy for Oklahoma City leaders to forge a stronger economy and community.